The crime comedy Seven Psychopaths, from writer/director Martin McDonagh (In Bruges), is equal parts gore and humor, with an absolutely adorable Shih Tzu thrown in, for good measure. Struggling screenwriter Marty Faranan (Colin Farrell) is past deadline and out of ideas, until he gets inspiration from his best friend Billy (Sam Rockwell) and the eccentric Hans (Christopher Walken), whose dog-napping business results in gangster Charlie Costello (Woody Harrelson) desperate to get his prized pooch back. At the film’s press day, co-stars Sam Rockwell and Christopher Walken talked about why they enjoy working with Martin McDonagh, the cemetery scene, what they found most memorable about working on the film, what inspired their performances, and delivering such great dialogue. Check out what they had to say after the jump. Question: What about Martin McDonagh’s sensibilities suited you well, in working with him? CHRISTOPHER WALKEN: I don’t know. I like him very much. They say casting is a big percentage of movies, and I think that’s true. If the casting is right, you don’t have to work as hard because whatever you are is what they’re looking for. I know there’s something about my personality that’s suited for this movie. Were you always offered the role that you played in the film, or did you look at some of the other roles too? WALKEN: Nah, there was really only one role that I could play. I’m much older than the rest of them. I suppose I could have played the Tom [Waits] part, maybe, but it’s better with him. How was it to work with your canine co-star, Bonny? 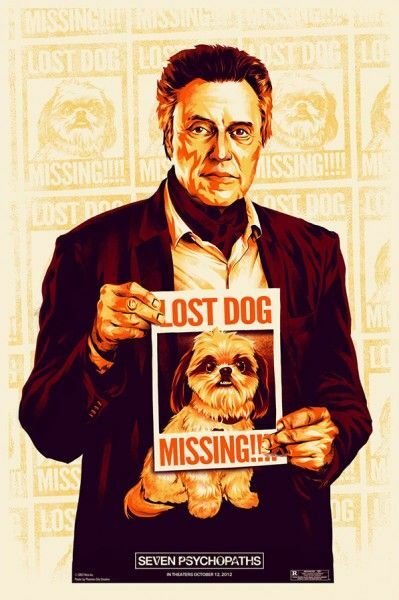 WALKEN: Everybody asks about that dog. That dog was great. Everything they say about working with animals is not true, when it comes to that dog. Also, I never saw a movie with a lot of rabbits before, and I thought it was such a great idea to put so many rabbits into one scene. Sam, can you talk about your character and his relationship with Colin Farrell’s character in the film? A lot of the comedic moments in the film come from the relationship between you guys, so how did you approach fleshing out these characters? SAM ROCKWELL: Colin and I had met each other 10 years previous, but we didn’t really know each other all that well. Chris and I already knew each other from the play that we did together, so Martin wanted Colin and I to bond. The three of us all went to Joshua Tree and rented a house there. At one point, we stopped at a rest stop and Colin picked out that bear hat that I wear in the movie. He found it and put it on my head. With both of you having known and worked with Martin McDonagh previously, how much of Martin did you see in the character of Marty? ROCKWELL: A little bit. It’s different because it’s Colin, but they both probably struggle from a bit of that inner-artist debate. Sam, how long did it take you to get your dialogue right, for the cemetery scene? ROCKWELL: Well, it Martin ended up using more of that footage than I originally thought he was going to, so I got lucky, in that respect. It was a good day that turned out great. As it turns out, that speech was the backbone of that whole sequence. Christopher, what did you think about having to come out of a coffin? WALKEN: Well, I knew there was the cemetery scene and I knew there was a lot of stuff in it, but I wasn’t aware of the specifics. I remember shooting that night, but I think I was only there for about an hour. I just got up into the coffin and they showed me how it was going to work. They said, “It pops up, and there you go!” They had so much to do that night, but I was there for only an hour. Did you guys feel freedom to expand your characters, or did you stick more with Martin’s vision? WALKEN: I didn’t really have anything to add. ROCKWELL: I probably had too many props, at some point. I usually over prop myself. I’m a prop whore. Eventually, the director usually starts to take things away slowly and de-prop me because I’m like Rambo with my arsenal of props. I overdo it, usually. What did you find memorable about playing these characters? WALKEN: I’ll be interested to see how regular audiences react. I had to go to the dentist recently and, when I walked in, the dentist says to me, “I’m looking forward to October 12th.” I said, “What? What’s happening then?” He said, “You know, your movie is opening,” and I said, “Oh, yeah, right.” So, when he and his family go see the movie, that’s when I can get an impression about this movie. W hen I’m on the road making a movie in another city, on my day off, I always go to the movies. I love going to the movies. You get a ticket and sit there, and it’s very interesting to be around people who aren’t personally invested in you, in any way. They’re just going to the movies. ROCKWELL: What’s memorable for me is the experience that we had on the film. It was such a great experience. We took our jobs very seriously, but we also had a lot of fun, and that’s what is really memorable for me. Of course, we want the movie to be a smash hit, but who knows what’s going to happen. I have memories of films that nobody ever saw, that I was very proud of, and those are still great memories. It would be great, if people saw this movie. It’s a cool movie. Were there any movies in particular that inspired you with this role and performance? ROCKWELL: I actually watched Colin in In Bruges, a couple of times, because I thought the rhythms and the characters were similar. I did watch that documentary Grizzly Man. I thought watching that guy was helpful. Also, Kathy Bates in Misery. I watched that because of her obsession with James Caan. WALKEN: I said to Martin once, in rehearsal for the play, “How did you ever come to write a play about a guy who goes around with a suitcase filled with cut-off hands?,” and he said, “You know, I was just sitting there one day and I thought to myself, ‘I wonder what it would be like for a guy who went all over the place with a suitcase filled with hands.’” It’s as simple as that. When you were reading the script, what was most surprising for you, in the development of the story? WALKEN: The whole thing is surprising. Whenever you read a script that has big chunks of intelligent and juicy dialogue, that’s pretty unusual. I have a lot of trouble with scripts. I have a lot of trouble imagining things while I’m reading them. Sometimes, if you’re lucky, before you start shooting, the actors will sit around a table and they read the script out loud. For me, that’s a big moment because, no matter how many times I read a script before I get there, I can’t see it. But, the moment that I get there, that’s when I finally can see it. Obviously, this was a terrific script, but I couldn’t imagine it. Do you seek out scripts with juicy dialogue, then? WALKEN: You always look for good stuff. Very few scripts have focus on what people are saying. Movies can be a lot of things, but they’re usually not about the kind of dialogue that tells you where you are and where you’re going. But, you don’t get really smart, fun stuff to say, all that often. I’ve made four studio movie musicals, over the years, but they just don’t make those kinds of movies now. 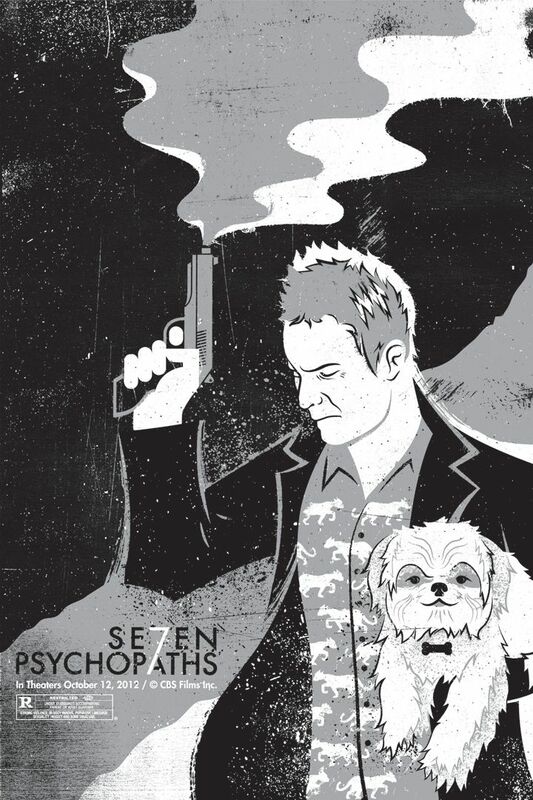 Seven Psychopaths opens in theaters on October 12th.